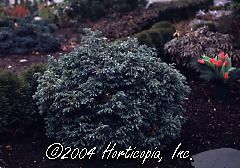 This miniature Boulevard Cypress has bright blue, curly foliage. Trained as a 'Pom Pom' special form. Grows very slowly to 2 feet tall in 10 years.